This summer Comet TV will be doing monster movie double features every Sunday (starting, uh... last Sunday). The first feature is always a Godzilla movie, the second is sometimes a Western B-movie and sometimes another kaiju film. "WITH GREAT POWER COMES GREAT RICE......."
Whoa. I missed it - wish I didn't! I certainly have seen Godzilla, King of the Monsters! 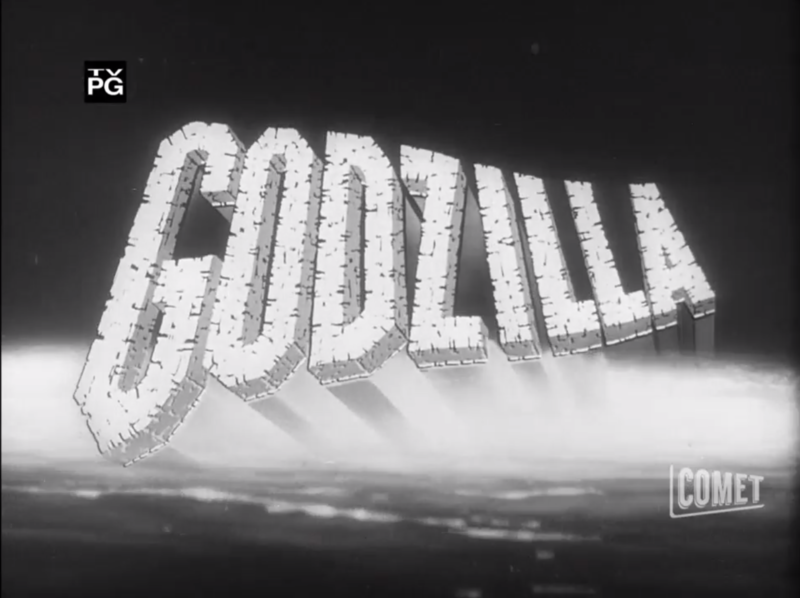 titled merely as 'Godzilla' in TV listings, but never have I heard of an alternate title card. Is is possible Comet got these movies from Janus films and Janus scrounged up a nice copy of Kaiju o Gojira for their upcoming release?! I thought something was different about those titles, but Comet looks so terrible usually (even on Verizon FIOS like I have), and it's been so long since I've seen anything but the Criterion disc of KOTM, that I didn't pay any mind to it. I do recall seeing it claimed that the original east coast and west coast releases of KOTM may have been slightly different, but no further details than that. Maybe this was an example of that? Speaking of differences, in Comet's Monster Summer promos, those clips of Monster Zero look somewhat different to me than the previous transfers we're used to. It's just something about the overall color balance and detail that seems different to me; I'm certainly going to check it out next Sunday. MONSTER ZERO is the same hybrid uncut English version that's on Starz! and Filmstruck. Glad that the alien language Tsuchiya made seems to now be in the default English language version of the film. lhb412 wrote: Glad that the alien language Tsuchiya made seems to now be in the default English language version of the film. The beauty of it is that it has the same effect in either language, though I think the cutting of it in the first attack by King Ghidora makes the X's "lights out" a little more impactful. I'd still like to see a remaster of the actual UPA cut. KotM ending on Comet right now. Missed the beginning, but closing credits are of the original US theatrical version included on Criterion's release. lhb412 wrote: KotM ending on Comet right now. Missed the beginning, but closing credits are of the original US theatrical version included on Criterion's release. KotM runs again on the 19th at 10:00am ET/PT, maybe someone can get a screengrab of that opening title card then. Spacehunter-m has a screencap. He's miffed about it - and indeed it seems to be the Kaiju-O Gojira title. That title card was also used in the original Italian release in the 50's, which was later re-edited into the infamous Cozzilla. ^ "infamous" ? Don't you mean beloved? ^I can totally believe it, but I don't remember it myself. It's weird: there were so many weird fandom things in the early-mid '00s that I must've completely ignored. I was young, and I suppose news about new movies and new US home video releases was what I was focused on and when other fans got hung up on minutia I didn't care about my eyes must've glazed over and I didn't absorb it. If I ever somehow became involved in an official Godzilla project like a movie or a comic or anything I'm afraid my first instinct would be not to please the fans but to irritate them, which I imagine would be a lot of fun to do. ^.... I have stared at this image for a solid minute. Who are these guys? Not being carried on DirecTV from what I can find. It's a free streaming channel available on your computer or Roku stick or whatever. It's mostly just a place for MGM to put their genre film and TV catalog. lhb412 wrote: It's a free streaming channel available on your computer or Roku stick or whatever. It's mostly just a place for MGM to put their genre film and TV catalog. They’re also broadcast over-the-airwaves. We get comet tv with our rabbit ears. They kinda remind me of MeTV but not *exactly* the same (comet is more old movies, metv is more old tv series). You can watch Comet right on their website; the streaming quality is actually decent, in fact it looks better than the substation feed I get over FIOS. That's where I capped that title card from.